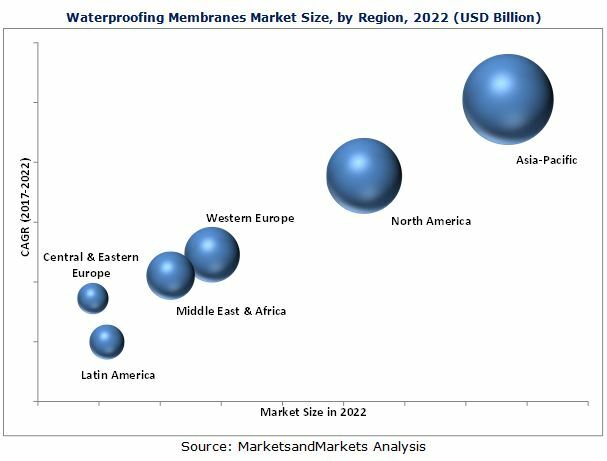 [168 Pages Report] The Waterproofing Membranes Market is projected to reach USD 40.19 Billion by 2022, at a CAGR of 9.3%. The waterproofing membranes market is growing at a rapid pace. This growth is attributed to the growing building & construction industry in most of the regions, such as Asia-Pacific, Middle East & Africa, and South America. These areas are witnessing an increasing demand for waterproofing membranes due to increasing governmental investments on infrastructure developments in majority of the emerging countries of these regions. In addition, increasing waste & water management activities in these countries have also triggered the demand for waterproofing globally. The report aims at estimating the market size and future growth potential of waterproofing membranes market which is segmented based on raw material type, application, and region. The base year considered for the study is 2016 and the market size is forecasted from 2017 to 2022. The report provides detailed information regarding the major factors influencing the growth of the waterproofing membranes market. It also analyzes the opportunities in the market for stakeholders and details of a competitive landscape for market leaders. Additionally, the report profiles the key players and comprehensively analyzes their core competencies. The research methodology used to estimate and forecast the market size included the top-down and bottom-up approach to estimate and validate the size of the waterproofing membranes market and estimate the size of various other dependent submarkets. This research study involved the use of extensive secondary sources, directories, and databases such as Bloomberg BusinessWeek and Factiva to collect information useful for this technical, market-oriented, and commercial study of the waterproofing membranes market. In-depth interviews with various primary respondents have been conducted to verify critical qualitative and quantitative information as well as to assess prospects. The value chain for the waterproofing membranes market begins with the research & product development and ends at the end users, such as building & construction, chemical, power, and oil & gas industries. The value chain includes manufacturers, such as Carlisle Companies Inc. (U.S.), Firestone Building Products Company, LLC (U.S.), Soprema Group (France), GSE Environmental (U.S.), BASF SE (Germany), The Dow Chemical Company (U.S.), Johns Manville (U.S.), Sika AG (Switzerland), and GAF Materials Corporation (U.S.). This research report categorizes the waterproofing membranes market based on type, application, and, region. The market is further analyzed based on key countries in each of these regions. The waterproofing membranes market is projected to reach USD 40.19 Billion by 2022, at a CAGR of 9.3%. The market is driven by the growing building & construction industry and increased use of waterproofing membranes in waste management and water treatment applications globally. However, the mature markets of Europe and North America are projected to restrict the growth to a certain extent. Waterproofing membranes are used for different applications such as roofing & walls, waste & water management, tunnels & landfills, bridges & highways, and mining. Roofing & walls is the largest application segment for waterproofing membranes across the world. Growing end-user industries in emerging nations, such as China and India, and energy efficiency are some of the drivers for the waterproofing membranes market. The prime driver for waterproofing membranes consumption comes from the increasing demand in developing countries, coupled with the growing preference for synthetic waterproofing membranes products in roofing applications. Various types of waterproofing membranes such as HDPE and LDPE are used in modern tunnel construction. As the tunnel construction industry is expected to grow due to the infrastructure and transport requirements, a rise in the demand for waterproofing membranes is expected during the forecast period. The water management industry, including waste management, water treatment, and wastewater treatment has a wide scope for its expansion, which in turn would help in increasing the consumption for waterproofing membranes during the forecast period. Asia-Pacific, North America, Western Europe, Central & Eastern Europe, South America, and Middle East & Africa are considered as the main regions for the waterproofing membranes market in the report. Currently, Asia-Pacific is the largest market for waterproofing membranes. 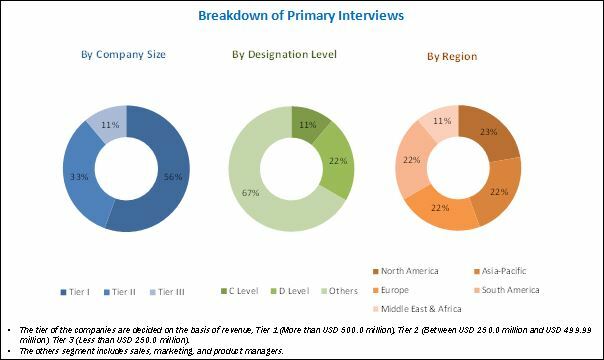 Some of the primary drivers for waterproofing membranes market growth globally include the impressive growth of the construction and water management industry, especially in the developing countries of Asia-Pacific region. The waterproofing membranes manufacturers are influenced by cost conscious customers. Most of the waterproofing membranes are petroleum-based and are vulnerable to fluctuations in the commodity prices. This is a major challenge for the waterproofing membranes industry as it is difficult to predict the future price of basic raw materials, which results in low investments in waterproofing system related projects. Carlisle Companies Inc. (U.S.), Firestone Building Products Company, LLC (U.S.), Soprema Group (France), GSE Environmental (U.S.), BASF (Germany), The Dow Chemical Company (U.S.), Johns Manville (U.S.), Sika (Switzerland), and GAF Materials Corporation (U.S.) are the leading companies operating in this market. These companies are expected to account for a significant market share in the near future. Companies are expected to leverage from the market growth and venture into new markets to improve their presence in regions such as Asia-Pacific, Africa, and South America. The other main manufacturers of waterproofing membranes are Renolit SE (Germany), Fosroc International Ltd (U.K.), GCP Applied Technologies Inc (U.S.) and Laticrete International (U.S.). 11.11.5 GCP Applied Technologies Inc.